Police in the Keonjhar district of Odisha are handing out Rs. 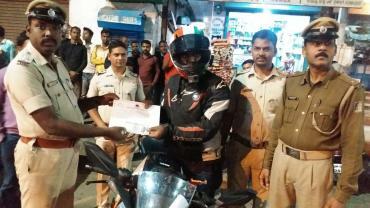 100 as cash reward and appreciation certificates to drivers who obey traffic rules and drive safely. The initiative has been launched with an aim to promote the importance of obeying traffic rules and prevent accidents. So far, 50 riders / drivers have received these cash rewards and certificates. As part of the initiative, the police conduct random checks to see if the driver is carrying the required documents like a valid driving license, insurance, etc. They also check whether the driver is wearing a seat belt / helmet, not using a mobile phone while driving and is obeying the speed limit. Drivers are also being put through a breathalyser test. Inspectors in charge of police stations have been given the job of choosing good drivers and awarding them the cash incentives on the spot.